Husband whatsapp me this picture. And I just posted about preparing him sushi for lunch a year ago. Angkara tikus atau tupai? One thing for sure, gotta get him a new lunch box. This lunch box brought back a lot of memories, though. I'm pretty sure he wouldn't want a replacement. This lunch box was actually one of the many first things we bought after marriage. And I must say, it was something Iz put on the top of his list on Things To Buy After Getting Married. I know it's not because he couldn't afford it ke apa, but because he wanted his wife to pack him lunch to work, just like his mother used to do for his father. Him sending me this picture, plus Facebook reminding me of preparing him sushi for lunch a year ago, made me reminisce on the good ol' days of struggling trying to be a good wife. Now terus tak jadi merajuk lama-lama. HAHA busted merajuk. I pun selalu pack kan husband i lunch. tapi tak pernah lagi la macam sushi semua tu. selalunya nasi. 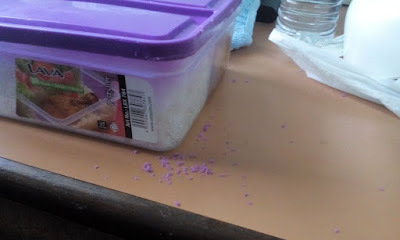 kami ni rice people :D tak makan nasik kang lapo. hehehe. Orait! Nanti kalau buat lagi bash ambil gambar cara-cara buat dia. Tapi yang paling basic je ni. Mommy cici, masa pantang pun I tak masak... Hahahah. Sekarang baru nak pick up balik rutin dulu.